Рецепт лучших в мире брауниз. С картинками. Жмите на ссылки. Today we are posting a tried-and-tested recipe of delicious brownies, turned into a worksheet. Print out this Best Ever Brownies Recipe, bake the famous dessert and let us know how it turned out! Teachers — you are free to download the worksheet and use in your classroom. I really HAVE baked it myself (the one in the picture was baked by the picture’s author, not me, though :)) — a number of times, so I bet you’ll find it yummy! I shared this recipe at our recent club meeting devoted to interesting dishes from around the world. Other materials from this session can be found here. 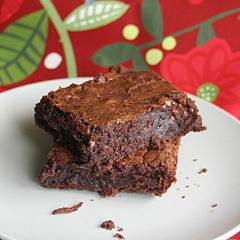 Wikipedia on brownies — here. Анонс будущих тем декабря — здесь.